Our cruise returned to Los Angele early in the morning, but our plane home did not leave until much later. We made a short visit to Long Beach. Without much time, we chose to only visit the Aquarium of the Pacific. Without planning to do it, we have spent a lot of time looking at sea life. In our younger days we enjoyed snorkeling and diving in the Virgin Islands. We have been to aquariums in Baltimore, Maryland, Tampa and Orlando, Florida, Bergen, Norway and Copenhagen, Denmark. I probably have forgotten a bunch. 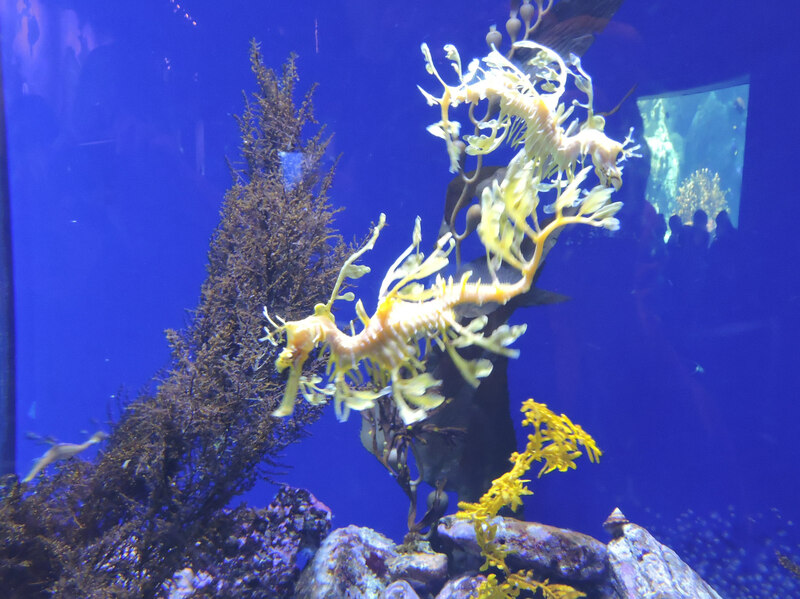 We agreed, however, that our few hours at the Aquarium of the Pacific in Long Beach were probably the best. Covering five acres, there was more than we could see. They had more jellyfish that we had ever seen before. Growing up on the Atlantic coast, we associated jellies with getting stung while swimming. I never realized how beautiful they could be. Alie now gleefully says “I petted a jellyfish!” It turns out you can handle the tops of some varieties without hurting yourself or them [although disinfecting lotion was available before and after]. With no brain, heart or lungs, these creatures have been around for over 500 million years. Giant Japanese Spider Crab can reach as much as 13 feet across. This entry was posted in Travel Logs and tagged Aquarium of the Pacific, Aquariums, California, Long Beach, Photography, Travel. Bookmark the permalink. A plate of crab legs, please. http://creepyanimals.com/2010/10/creature-of-the-deep-japanese-spider-crab/ And kids! Gotta’ love em’… from a distance… when they’re asleep. 🙂 We happened to visit San Juan Capistrano last March on Fourth Grade Day. Hundred of them. Behaved, more or less, but crowded. Oh my out of the mouths of babes as they say! The aquarium sounds astounding. Give acres of sea life and I would love to touch the jellyfish. I’ve always thought of them as well as ready to sting one senseless. I visited ted Long Beach just about the time the dinosaurs stopped roaming the earth. Such fun as a teenager. That aquarium sounds fascinating and huge, I’d like to see it someday. 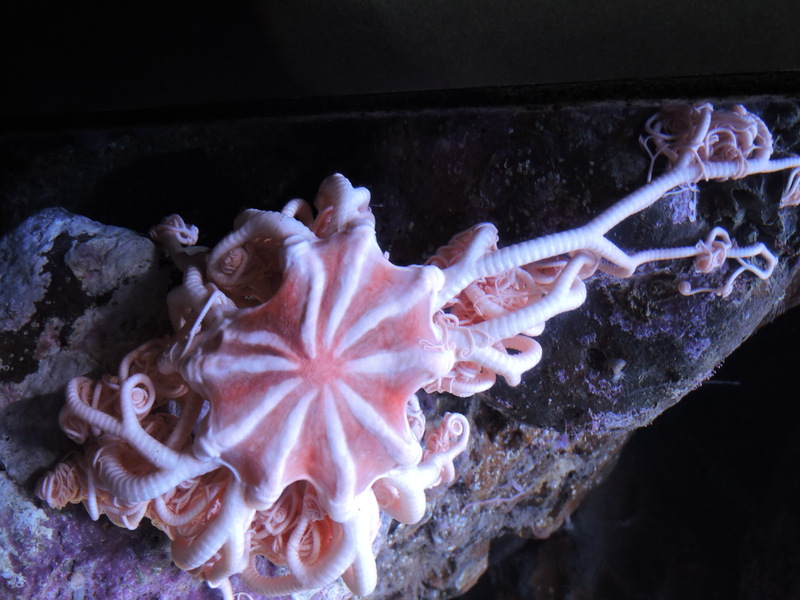 Basket stars are cool and intricate, especially when they’re unfurled. I’ve seen ’em on dives, but not for a long time. I also had a chance to touch jellyfish – the non-stinging sort while snorkeling at Jellyfish Lake in Palau. The ocean sometimes seems like another planet. On my early dives, I was fortunate to have a dive guide who was interested in showing us the small gems as well as the big fish that everyone loves. I think he found my first basket star down inside a sponge and gently took it out. Our experience with jelly fish was mostly limited to getting stung swimming in Chesapeake Bay, so we were surprised to be able to touch one. The variety of underwater life is astounding. And to think that most of us never have or never will see these sea creatures in their natural setting, not least because they being destroyed by the effects of our destructive ways of life.